Kit's copyright date is 1995. I paid $20.00 for mine back then at my local hobby shop. The box art shows a Fokker D.VIII flying above clouds, illustrated on a oval against a light tan background. The aircraft has a yellow cowling and no. 5 on its side in front of the German cross. The elevators are yellow too and the rudder is white with a black German cross on it. The wheels have yellow hub caps on them. An illustration of Hans Goerth smoking a cigarette is done in black and white. 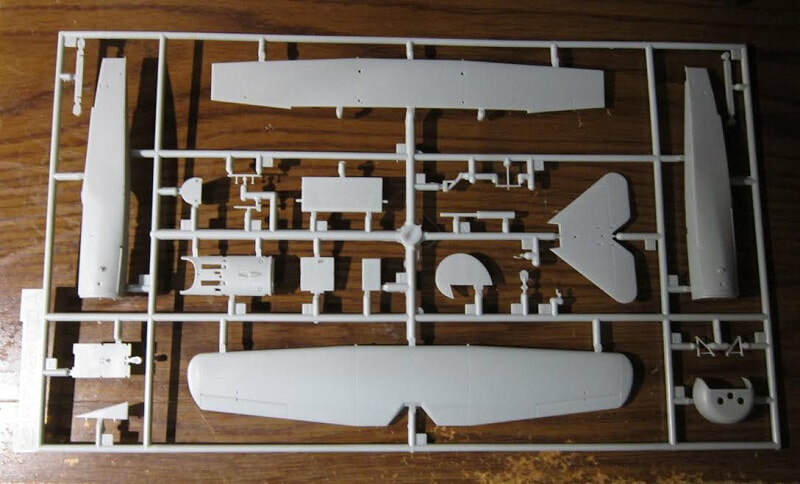 One corner of the box art says the kit contains 83 parts, a model of one aircraft and one figure bust and is designed for modelers over 10 years of age. One side panel has one paragraph histories of the Fokker in 6 languages, each labeled with a color illustration of the country that speaks those languages, including English. This is followed by a CAUTION to be in a well ventilated room when using cement or paint, in the 6 languages again. Followed by the statement that the kit is not for children under 3 due to small parts, but is designed for modelers age 10 to adult. The other side panel has 4 color photos on it. 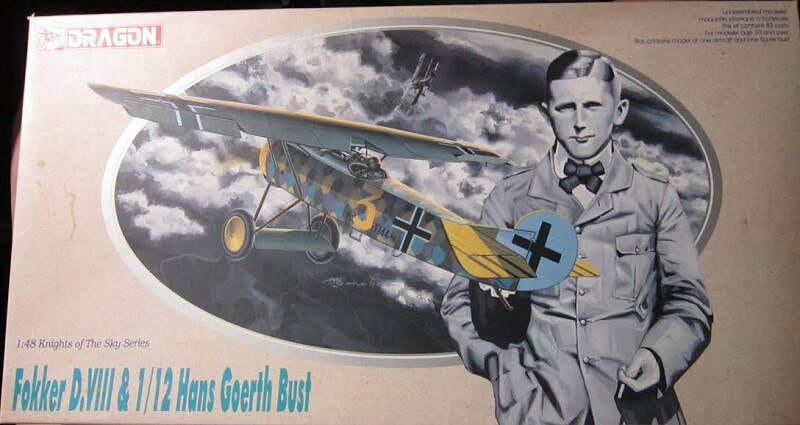 Three of them show the Fokker made up and the 4th shows the bust of Goerth. This is followed by the copyright of the kit of 1995 and DML's street address in Hong Kong, China and the kit was manufactured there. This kit contains 6 light-grey trees, a clear tree, 2 steel PE frets, 2 decal sheets and the instructions. Plastic parts are in 2 sealed cello bags. 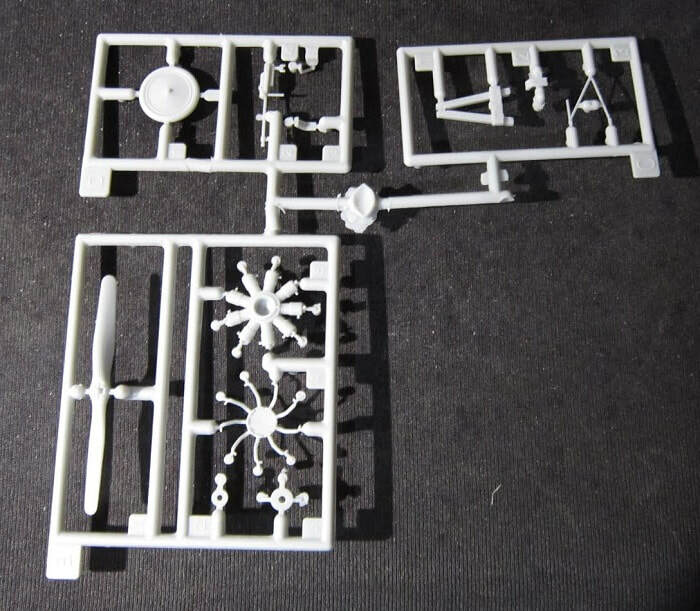 The kit also includes 4 light tan parts for the Goerth figure in a bubble pack and a length of steel rod. ​Trees letter B, C & D are co-joined and there are 2 identical trees of C and D.
​The clear tree holds just one part of the letter E wind screen. 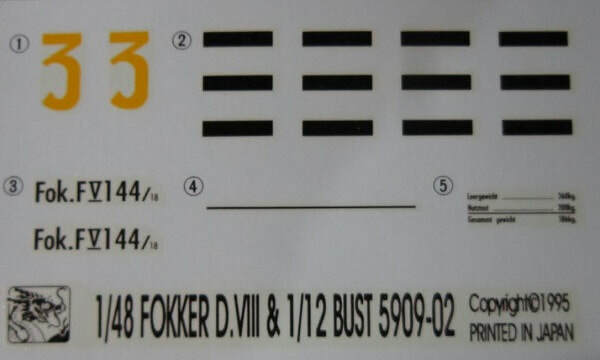 ​The smaller decal sheet has black stripes that go atop the elevators, the yellow no. 3 for the fuselage sides, Fok.FV144/18 that goes on the fuselage sides with a information stencil. The larger decal sheet has the German crosses and lozenge patterns for the fuselage etc. ​The first steel PE fret, letter MA, holds, engine rods, seat belts, perforated cooling jackets for the machine guns etc (20 parts) One part is shaded out in the parts trees illustrations as being excess and not needed to complete the model. These two frets are inside sealed cello bags with stiff cards to protect them from bending and taped atop a cardboard shelf at one end of the kits tray. The length of steel rod is to be used to fabricate wing struts and landing gear bracing. ​The 4 light tan resin parts form the bust of Goerth. It includes his torso, head and hat and base. He us sawed off at the elbows and has no forearms or hands as he is shown on the box art. This kit is very well detailed and will make up into a spectacular display.